If you have a pond or lake on your property and are considering sprucing it up with a pond floating fountain, you’re going to need to figure out what size fountain would be best for your lake or pond. 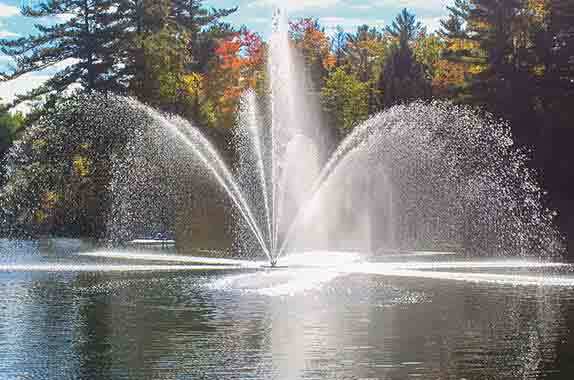 It really depends on what you want your pond floating fountain to look like, in regards to the spray design and size. You want to ensure the height of the Fountain isn’t too big in comparison to the size of the pond or lake. You don’t want your pond emptying because your spray pattern is too large. The shape and height wanted for the pond floating fountain will help you decide the Horsepower you need for your lake or pond Fountain. And of course, the voltage you actually have available. Arbrux has 6 spray patterns; The Tulip, Orchid, Iris, Jade, Juniper and the Willow. Our Fountains range from ½ Horsepower, up to a 10 Horsepower. Tulip 6 ft. 5 ft.
Orchid 6 ft. 14 ft.
Iris 6 ft. 9 ft.
Jade 8 ft. 15 ft.
Juniper 8 ft. 4 ft.
Willow 6 ft. 9 ft.
Tulip 13 ft. 9 ft.
Orchid 13 ft. 24 ft.
Iris 12 ft. 15 ft.
Jade 12 ft. 22 ft.
Juniper 11 ft. 4 ft.
Willow 14 ft. 20 ft.
Tulip 16 ft. 11 ft.
Orchid 18 ft. 27 ft.
Iris 15 ft. 17 ft.
Jade 20 ft. 24 ft.
Juniper 15 ft. 5 ft.
Willow 19 ft. 22 ft.
Tulip 20 ft. 14 ft.
Orchid 22 ft. 30 ft.
Iris 18 ft. 21 ft.
Jade 25 ft. 30 ft.
Juniper 19 ft. 5 ft.
Willow 22 ft. 26 ft.
Tulip 27 ft. 17 ft.
Orchid 29 ft. 36 ft.
Iris 24 ft. 24 ft.
Jade 36 ft. 30 ft.
Juniper 25 ft. 8 ft.
Willow 30 ft. 30 ft.
Tulip 35 ft. 18 ft.
Orchid 35 ft. 38 ft.
Iris 32 ft. 27 ft.
Jade 40 ft. 38 ft.
Juniper 34 ft. 8 ft.
Willow 36 ft. 36 ft.
Tulip 42 ft. 22 ft.
Orchid 42 ft. 42 ft.
Iris 36 ft. 32 ft.
Jade 46 ft. 46 ft.
Juniper 42 ft. 10 ft.
Willow 42 ft. 42 ft. If you would like to see the various spray patterns, please check out our website here !